LONDON—A semi-quiet Day 4 at Wimbledon ended with an explosion. 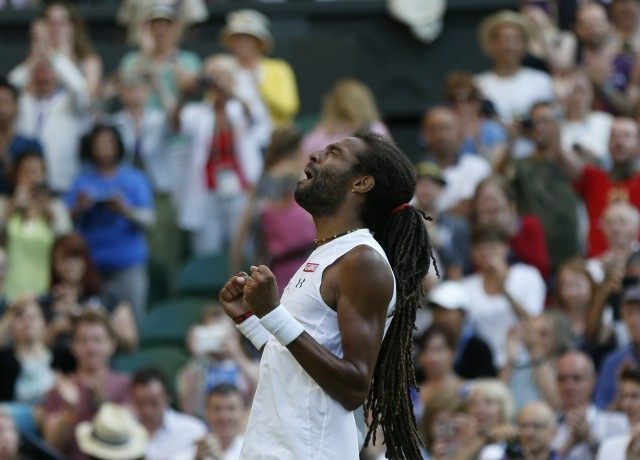 Qualifier Dustin Brown, ranked 102 in the world, defeated tenth seed Rafael Nadal 7-5, 3-6, 6-4, 6-4. How did he do it? The old fashion way! Serve and volley. Look at these stats. It blows everyone away. It is why all time great Roger Federer hired Stefan Edberg as coach. Serve and volley. Well, in this court especially, you meet players that don’t want to play from the baseline sometimes. This opponent is one of these ones. You cannot have mistakes against a player like him with that big serve. You know, nothing to lose. Serving first and second almost the same speed. Brown flew through the match with ease, almost as if the grass court was a ballroom floor. The old Nadal peaked through every once in awhile. He fought off match point in the fourth set and then held Brown at love to force another game, but it was not enough. Wimbledon is not friendly to Nadal these past few years. I know I am going to every tournament with the right motivation, working well. I think I made all the things well to prepare here this tournament. In other news, Roger Federer easily defeated American Sam Querrey in straight sets. After the match, Querrey said that “you want to go over and give him a high five sometimes, but you can’t do that” because of the moves Federer makes during his matches. Andy Murray demolished Robin Hasse in straight sets. Not all seeds made it out alive like Rafa. Vasek Pospisil defeated 30th seed Fabio Fognini while Georgian Nikoloz Basilashvili, ranked 153 in the world, ousted 15th seed Feliciano Lopez. Sabine Lisicki, 2013 Wimbledon finalist and 18th seed, suffered a scare on centre court today when she easily dropped the first set to American Christina McHale 2-6. She committed 14 unforced errors to McHale’s one. The announcers revealed Lisicki, who loves grass, is allergic to grass and the pollen count is very high in London. But she found her groove, managed to win the second set 7-5, and then demolished McHale in the third set 6-1. Defending champion Petra Kvitova is Sonic the Hedgehog because no one is stopping her. She lost three games in her first two matches. THREE. Both were also under an hour. Even better for her are other seeds dropping like flies. Magdalena Rybarikova defeated eighth seed Ekaterina Makarova in straight sets while Olga Govortsova defeated 25th seed Alize Cornet. Agnieszka Radwanska’s dominating wins in the first two rounds are flying under the radar. The 13th seed looks clean and crisp to make huge rumbles in the tournament. Caroline Wozniacki, seeded fifth, crushed Denisa Allertova in the first set and then went up 5-1 in the second set, only to allow Allertova to push a tiebreak. Wozniacki managed to win it, though. Angelique Kerber, seeded tenth and my personal dark horse, won in straight sets. American up-and-coming superstar Madison Keys also advanced to the third round.